If Forge's band's name is called, he will go up as himself, leaving aside his costume and alter ego. He has two chances: Ghost is up for best rock album and best rock song. It's a category switch from 2016, when it won for best metal performance. Forge, who creates demonic characters for every album, has slipped into his latest, the creepy Cardinal Copia, to tour with the new CD, "Prequelle," which continues the band's ability to mix the metal of Scorpions or Ratt with a surprisingly tight sax solo. Forge was unmasked in 2017 when former band members sued him, forcing him to reveal his identity. "Prequelle" hit No. 3 on the Billboard 200 albums chart and No. 1 on the top rock album list, spawning the Top 20 rock hits "Rats" and "Dance Macabre." Forge took time out from Ghost's European tour to chat with The Associated Press by phone about his sound, switching categories and losing his anonymity. Forge: I guess I am a somewhat composed guy. But, obviously, the last time you saw me there, also, we were in character. And it doesn't really translate very well. Any sentiments you may have — unless it's wrath — it won't show very well. But I was ecstatic, absolutely. Forge: From a comfort level and just to make it doable, we're just leaving the Cardinal in Germany to wait for us to come back. He has to stay there. But, you know, we'll get him a room and a harem. He'll be fine. 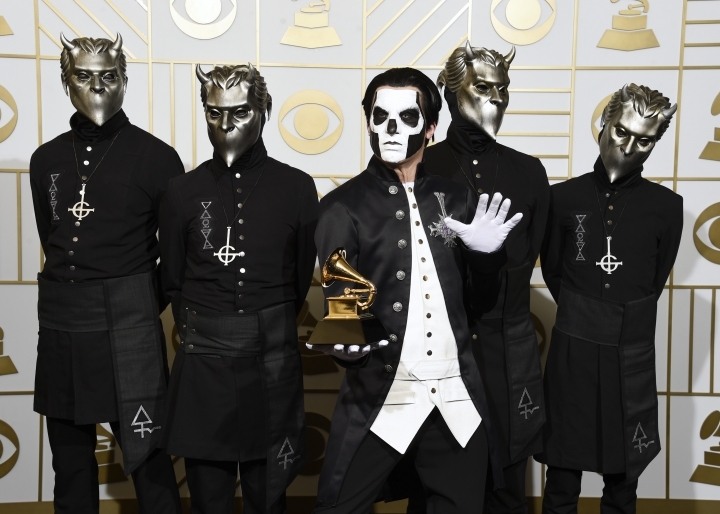 AP: At the '16 Grammys, you competed in the metal category. This year, you're in two rock categories. Have they changed the way they look at you or have you changed your approach to music? Forge: Each record is its own being but you will recognize the style — there are certain fingerprints in there, there are certain traces of DNA — that will be unmistakably mine. But I personally don't believe that our step is so far out of the zone that we should naturally change categories. Forge: All of a sudden, you're playing with the big boys and girls. Over time, the best rock category has had Coldplay, Kings of Leon, Foo Fighters, The Killers — all these bands that are obviously bigger than we are. You're playing in a different league. I don't feel certain about winning at all. I wouldn't even if we were in the metal category. We'll see what happens. I'm just happy to be nominated once again. Forge: I don't feel the need to categorize what we do. Let me put it this way, if I'm in a cab, and the cab driver says, "What do you sound like?" Depending on the age, if it's someone likely to know who Alice Cooper is, I'd say, "Well, it's theatrical rock, kind of like Alice Cooper or Kiss." That's basically what it is in laymen's terms. At the end of the day, I think that the easiest way to explain it is melodic rock music with a big theatrical presentation. AP: You'll be opening for Metallica on tour this summer. How does that feel? Forge: I grew up with Metallica. Definitely from an early age, I became a fan. They've inspired me tremendously. Obviously, one of my favorite bands. A huge inspiration musically. They've been mentors without practically doing it themselves. They've always mentored me. Without them, I wouldn't be here. Forge: I had to reconfigure things, especially in my head. I was very, very happy being anonymous. It made things easy. I could say yes to just a few things and no to everything else. Everything was cool. But being in an anonymous band doesn't go very well with the idea of wanting to become a known band. And it's always been like that. If you want to become known, it kind of rules out the idea of not being known. It's a contradiction.